One of the greatest challenges facing society is our growing energy consumption. 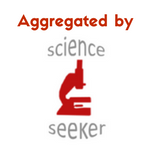 Figuring out how to provide sustainable energy is an important topic of research. In this Perspectives article, Emily Weiss discusses some basic research in nanoscience and chemistry that will provide the foundation for further advances in energy technology. One obvious source of renewable energy is the sun. We can use the energy in sunlight to overcome energy barriers to chemical reactions, a process called photocatalysis. This occurs frequently in nature – one well-known photocatalytic reaction is photosynthesis. We can use light to drive reactions in a variety of ways, but some useful applications include reducing carbon dioxide to methane, making hydrogen gas from protons in solution, and producing ammonia via nitrogen fixation. One promising material for photocatalysis is the quantum dot, a nano-sized particle of a crystal. Not only do quantum dots strongly absorb light, they also are so small that many of their atoms are exposed on the surface, rather than being surrounded inside the quantum dot. Absorption of light causes energy to be generated inside the quantum dot, which can then be transferred to the surface in the form of electrons and used in chemical reactions. Because quantum dots are so small, the electrons have little distance to travel and there are many surface sites at which reactions can occur. In addition, the crystal lattice sites at the surface of the quantum dot can be attached to molecules called ligands. These ligands can be chosen to facilitate the chemical catalysis done by the quantum dot. Many photocatalytic reactions may be thermodynamically spontaneous, which means the energy of the products is lower than the energy of the reactants, and the reaction should occur. However, some have high kinetic barriers, making the reaction progress very, very slowly. One example of this kind of barrier occurs when the reactants and photocatalyst must be brought together for the reaction to occur, but their motion is slow and relies on diffusion of the different molecules in solution. This is where the ligands on the surface of the quantum dot are key to efficient photocatalysis. Different ligands can be employed to help overcome kinetic barriers and facilitate the catalytic reaction. This paper discusses using ligands to engineer the energy levels of the quantum dot so that the electron can hop between the quantum dot catalyst and the molecule receiving the electron. Ligands can also be used to efficiently extract the positive charge left behind in the quantum dot when the electron is generated from light energy. This allows the quantum dot to continue photocatalysis without degrading. Finally, ligands can be used to increase the number of protons near the quantum dot catalyst for reactions like hydrogen production, which depends on proton concentration. Figure 1. Schematic showing a functionalized viologen ligand electrostatically interacting with a quantum dot surface. The red arrow shows electron transfer through the alkyl chain while the blue arrow shows electron transfer through space. Figure 1 shows an example of how electrostatic interactions between the quantum dot’s ligands and other molecules can improve electron transfer from the quantum dot. The molecule shown, a viologen, is electrostatically adsorbed onto the quantum dot surface by ligand interactions. 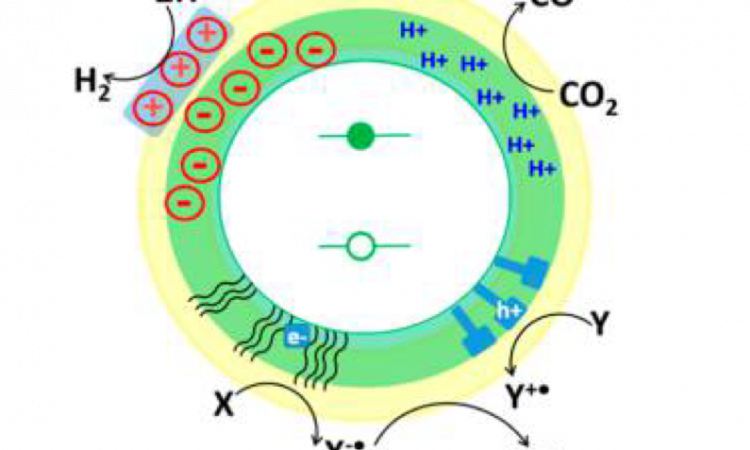 Because the negative charge on the oxygen is attracted to positive charges on the quantum dot surface (not shown), the viologen molecule is pulled to the surface of the quantum dot. Once the viologen molecule is close to the surface of the quantum dot, there are two pathways for the electron to transfer from the quantum dot to the viologen. The red arrow indicates electron transfer through the alkyl chain of the viologen; the blue arrow indicates electron transfer through space directly to the viologen. However, the researchers found that increasing the alkyl chain length doesn’t affect the rate of electron transfer, which means that electrons must instead be transferring through space by the blue-arrow pathway. Through-space electron transfer is very fast, so learning how to enable it In a catalytic system employing a quantum dot will improve efficiency. Figure 2. 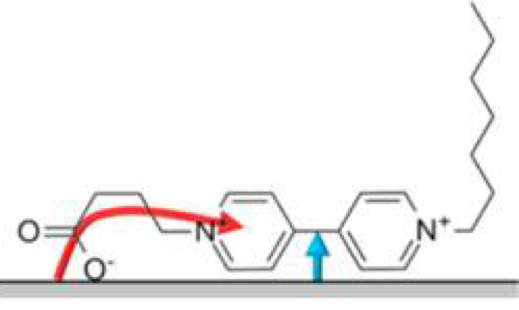 Hole transfer from a quantum dot to phenothiazine (a hole acceptor) via a bridge molecule (phenyldithiocarbamate). The schematic also shows the generation of an electron (e-) and hole (h+, the positive charge left behind by the electron) when the quantum dot is excited by light (hv). Another way to use ligands to enhance catalytic processes is by removing the hole from the quantum dot more quickly. In catalytic systems, holes can be used in redox chemistry, and fast hole removal allows the quantum dot to continue its photocatalysis. 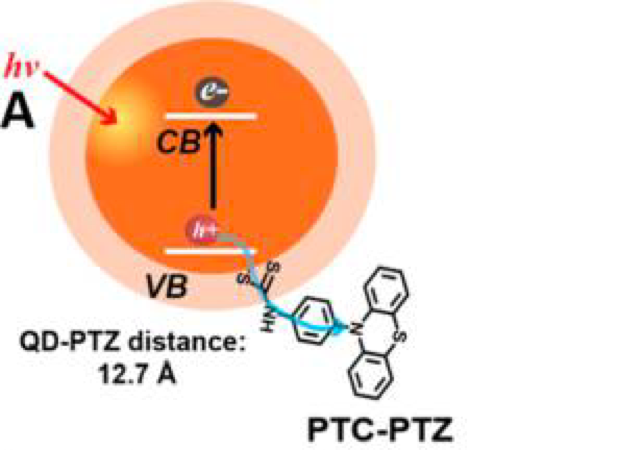 Figure 2 shows one way to do enable fast hole removal: linking phenothiazine (PTZ, a hole accepting molecule) to the quantum dot using a phenyldithiocarbamate (PTC) bridge as a ligand on the quantum dot. PTC is a hole-delocalizing ligand, so it extends the region in which the hole can exist to a little beyond the quantum dot. This improves what we call the electronic coupling of the hole with molecules close to the quantum dot, allowing for much faster transfer of the hole to PTZ. Figure 3. Phosphonoalkanoate ligands on a quantum dot surface at different pHs, showing how protonation of the ligand can bring protons closer to the surface of the quantum dot for photocatalysis. Another important factor in photocatalytic efficiency is the rate at which reactants reach the catalyst. If reactants can’t reach the catalyst quickly, the overall efficiency of photocatalysis will be slow even if electron transfer and hole removal are efficient. A method to overcome this in the case of reactions that require protons is demonstrated in Figure 3. Phosphonoalkanoate ligands have an acidic proton at pHs less than 8.5 (shown in red) that can be donated to other species in acid-base reactions. By changing the pH, and therefore the amount of protonation, the concentration of protons at the surface of the quantum dot (which is acting as the catalyst) can be increased. This could be one method to increase the efficiency of reactions that depend on protons. Quantum dots have many advantages as photocatalysts. Tailoring their surfaces using ligands to enhance specific catalytic reactions could expand their potential even more. Many questions surrounding the basic science of these tiny crystals remain unanswered, which makes research in the field of nanoscience all the more exciting! Ph.D. candidate in chemistry at CU-Boulder. Likes bikes, dogs, and beer.